Below keeps a dialogue that I have with a visitor of Benefits of Honey from Ohio, North America, Pam, who just started keeping bees not too long ago. (And she has graciously allowed me to share in this website.) You may not have any special interest in beekeeping but what Pam shares is going to fascinate you about bees, and next time when you see a honey bee resting on a flower, you will stop for while just to ponder and appreciate this amazing buzzing creature. 1. 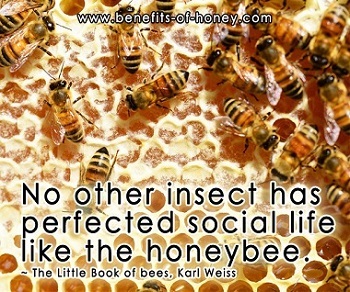 What makes you take up beekeeping and become a bee-person? I had a friend that lived in my neighborhood many years ago and he had one of the most relaxing back yards I had ever been. She maintained a lovely garden in the back part of her property - there were vegetables, flowers and herbs growing in different sections of the garden. In the back corner, she had one hive. She often spoke of the honey she gathered from her hive. I didn't have the opportunity until recently to begin looking into the possibility. When I told my friend Rick about that experience, he shared his experience growing up in Cincinnati, Ohio on a farm where his Grandfather had a few hives. His stories of getting fresh honey and chewing on honeycomb started us thinking of giving it a try. We enjoy it tremendously. 2. Did you learn the art of beekeeping from someone? It is a learn-as-we-go process. There is so very much to be learned about bees and beekeeping that our learning will go on for years. We are learning from watching videos, reading books and above all-just doing it. There are also some beekeeping associations that we are in contact with whenever we have questions. We email them and we typically get a response within 24 hours. 3. How did you get your hives, did you buy them? Yes we did buy the hives and the bees. We did some research and decided upon an Apiary out of North Carolina to buy all of our beekeeping equipment. We bought a package of bees from a business in California (this was our first colony) and the second from someone that lives approx 2 hours from us. 4. Most people do not react well to the sight of swarming bees, were you afraid of the bees when you first started out as a beekeeper? If yes, how did you overcome that fear? Yes. I would always swat at them or duck away from them. Knowledge. The more we read about these amazing insects, the more respect I gained for them. I go out to our hives just to watch them come in from foraging and watch the others take flight to get the nectar and pollen. I stand next to the hives without the beekeeping uniform on. I have learned from reading and experience that if you don't make quick jerky movements and basically remain calm, they aren't as likely to sting. They only sting to protect themselves or their colony. Standing in front of the hive is not advisable-you would be in their way as they leave or return. I would imagine that the possibility of being stung would be greater in that instance. When we go into the hive, we always are in full-gear --suit, hat with netting, and gloves. 5. Do beekeepers get stung by bees? And what's your experience so far? Is beekeeping dangerous? Yes, but so far, I have not been stung before. I suppose there is the chance of it happening. I know once it does happen, there is a certain way of taking out the stinger- and you are supposed to take it out immediately so that other bees don't smell the scent. It is only dangerous for those that have an allergic reaction to bee stings. Bees inject a "poison" and some people's systems can't handle it. There are some over-the-counter drugs that you can take if you do have an allergic reaction. We have some on hand in the event one of our guests get stung. 6. We all always use the phrase "as busy as the bee", just wondering, do bees sleep or rest at all? 7. Do bees recognize their hive? From what I have read and observed, they do recognize their hive. As you can see in the pictures I previously sent, our two hives are about a foot apart. As we stand and observe the bees leaving and returning after foraging, they do know which hive to return to. From what I have read, the bees (either young bees leaving the hive for the first time or the packaged bees we received and placed into the hive) upon leaving the hive for the first time turn and view the hive and buzz around it to know where it's location is and what it looks like. 8. Can bees recognize their owner, the beekeeper (you)? I cannot answer this with complete knowledge, but believe that they do know us in some way. We have not been bothered when we go out to the hives (and stand back from them) without our suits on. As we go further into the season, we will see if the behavior of the bees remain the same or if it changes. Right now, it seems as though their only interest is gathering nectar, pollen and water. 9. Do bees from the same hive have different temperaments like humans? Have you encountered the more aggressive bees and the gentler bees? Not so far. The types of bees we bought are the gentler bees. The only time there is aggression (at this point in time) is when we enter their hive-which is something we try not to do too often since it could be a detriment to the colony, (should the queen escape or get crushed as we are working with the frames, as well as the bees using the time to protect rather than produce honey). 10. As a beekeeper, do you become more sensitive or more in tuned to nature - the weather and environment? Yes. I have always had a love for nature. Our backyard is a wonderful place to be in. It has mature trees all around and there is a small creek that divides the property lines of the neighbors behind us. It's perfect for me-we have a few bird feeders around the patio and have regular "visitors" to them. Finches, Cardinals, Titmouse, Nuthatches, Chickadees and Woodpeckers are some of the regulars. In regards to the bees, I am more aware of weather since the bees are definitely more active on sunny days. There is reduced activity of the bees flying out to forage on cloudy days and rainy days. We have read that the bees tend to be angry on these types of days since they are not able to forage as easily. In regards to the environment, I am even more conscious of pesticides and chemical treatments and the harm they can have to humans as well as the "good" creatures we have on earth, such as the bees. 11. What's the most fulfilling part of a beekeeper's job? In the few months we have been beekeepers, I would say the most fulfilling at this point in beekeeping is gaining understanding of the magnificent creatures. It is fascinating to stand by the bee yard and just watch (and learn) them taking off to forage and coming home with the "motherload"! We can actually see the pollen baskets on their hind legs filled with bright orange pollen as they land on the entrance board to the hive! 1. Let Quirky Beekeeper Geoff make you laugh with his answers to the same questions above! 2. A platform for newbies in beekeeping and anyone who has a question about bees: Tips for New Beekeepers. End of "11 Q&As on Beekeeping (An Insightful Interview with a Beekeeper)". Back to "20 Amazing Honey Bee Facts!"